After a rather intense six months writing my craft book (which comes out in just a few short months eek) I needed to hang up the glue gun for a while just to recharge my crafty batteries. Rested and now ready to go I thought it was time to get my craft on again. I love wearing hair flowers and fascinators. They can finish an outfit off perfectly and if you are a dab hand at dressmaking you can even make matching hair adornments in the same fabric as your dress. Two squares of fabric in contrasting colours approximately half a meter in length each. These needs to have a high polyester count. Using your circles as a pattern cut out your polyester. You will need about ten circles so do equal amounts with less small ones. Light your tea light. Ensure you have a bowl of water next to you whilst you do this step in case you need to drop your fabric into it. Hold your fabric petal just above the tea light flame and keep moving it around. The heat from the candle will gently bend the fabric so the edges start to curl inwards and resemble petals. Do this for all your petal cut-outs. Make up your flower by putting the biggest petals at the bottom and layering the smaller circles on top. Secure these with needle and thread and finish of with a button which acts as your flowers middle. Cut a small strip of felt the same length of your hair clip. Glue gun this to the back of your flower. Once this is dry glue your hair clip to it. You have now made your rockabilly inspired hair flower. How simple was that! You can use this technique for brooches, bigger fascinators by making a few of the flowers and gluing them onto a hair band or even as really special decoration for a present. 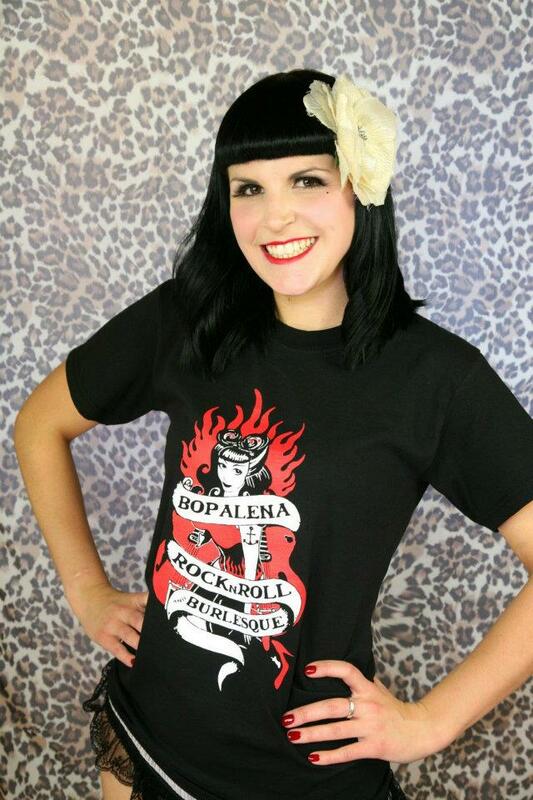 This week I'm offering one of my lucky readers a Bopalena Tee shirt. Designed and hand printed by the fabulous Nick Bee at BB Designs and available to buy at my boutique it will make a rather fabulous Rockabilly addition to your wardrobe. Available in sizes small, medium and large. Leave a comment on Mondays post.